Deadbeat Customs is proud to announce the inclusion of S100 to our catalogue! 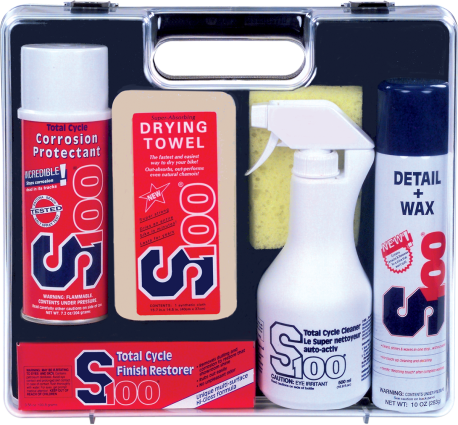 Since 1985, S100 Cycle Care Products has provided and performed to exceed the expectations for great cleaning supplies. S100 has been used, tested, and recommended by Harley-Davidson Motor Co. since 1986. S100 has released an “essentials pack” which includes detailing cleaners, restorers, waxes, as well as their unique Super-Absorbent Drying Towel and an applicator sponge. This all-in-one pack is a great value for a detailing kit and will help you with anything from a basic clean to polishing dulled paint finishes. When spring comes along and the roads are still a bit salty, you’ll definitely want to try this protectant by S100 Cycle Care Products. S100’s Corrosion Protectant formula can be sprayed onto a clean area of your bike to prevent rust and eventual corrosion. This formula is water-resistant so it won’t wash off easily in rainy weather, providing you long-lasting protection against the elements. The S100 Total Cycle Cleaner works harder than your average detailing cleaner. Dirt builds up in places where you can’t see it, and traps in moisture, threatening the risk of corrosion. The Total Cycle Cleaner goes above and beyond to loosen dirt and grime particles, to easily be washed off with a hose. Regardless of how well you take care of your motorcycle, eventually the road takes its toll. A once-shiny finish can tarnish and become dull. S100’s Total Cycle Finish Restorer is a perfect solution to this problem. This formula can return tarnished stainless steel, chrome, aluminum, and other body materials to their original shine. Find these and more S100 Cycle Care Products at www.deadbeatcustoms.com!